Right along with Facebook, YouTube and blogging, Twitter is one of the most often written about social media communication tools. 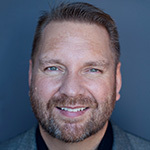 (Follow me @leeodden) We’ve run polls about how people use Twitter as well as aggregated tips from the Twitter community on how to get the most productivity out of it. 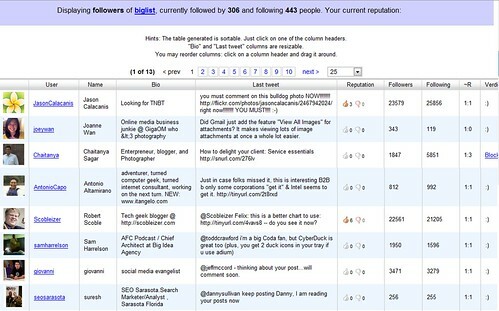 This post shares a few new Twitter tools you may find useful. TweetWheel – You may have a 100 or even 1000 followers. Which of your followers know each other? Tweet Wheel helps you find out visually. Note, if you have a LOT of followers, this will take a while. The account I searched on has around 1,400 followers and it looks like Tweet Wheel limits the display to 100 or so. There’s only so much room on the screen. Who Should i Follow? 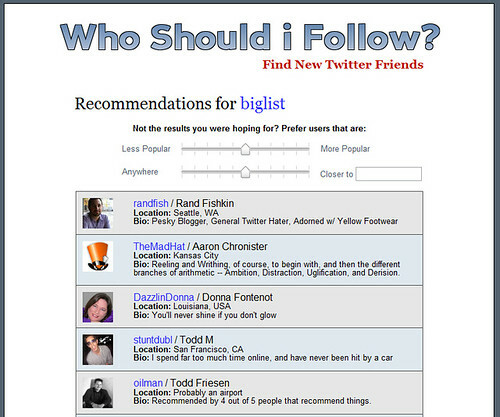 – Whether you’re new on Twitter or an early adopter, there are likely people you should be following, but aren’t. Which begs the question, “Who should I follow?”. That’s where the tool, whoshouldifollow.com comes in. 🙂 It looks at who’s following you that you’re not following back and has sliders for filtering by popularity and physical location. Twerpscan – Now that you’ve beefed up your list of people to follow, who shouldn’t be following you? If there are opportunistic marketers following everyone under the sun in the hopes those good souls will just automatically follow them back, this tool might help identify those whom you may want to block. The thing about this tool is that you have to login, so you may want to change your password to something temporary before running the tool and then change it back when you’re done. Twerpscan checks the number of followers of everyone on your contact list, the number of people they are following, and the ratio between them offering each follower’s name, bio, last tweet, a reputation thumbs up or down, followers, following and a link to block the follower if the ratio is over the threshold you set. Summize – While other tools for searching Twitter have been around a while, they’re often not stable or consistent. 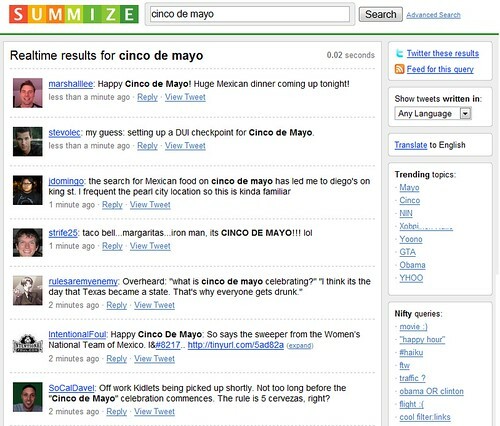 Summize is FAST and shows trending topics plus different language searches. There are also some nifty search operators like the one that helps you look for Tweets where people say “cool” but only Tweets that include links. Of course, there is an RSS feed for any search results page as well. Twitt(url)y – Where do we find out about many of these tools and news before the rest of the Twittersphere? Friendfeed is first but after that, Twitt(url)y does a nice job of providing a Techmeme style representation of up and coming URLs that are mentioned in individual Tweets. You can filter out Tweets by language and what’s neat is that the links are kept accurate whether Tweets use a URL shortening service or not by actually visiting each link. Twitt(url)y is a useful site as an early warning on news and trends. That’s our five tools and here’s a bonus time waster if you haven’t seen it already. It’s probably good you can’t see the identity of who is writing because, well, that’s sort of obvious. The challenge and opportunity with social tools like Twitter is that it can be very easy to fall into wasting a lot of time. But if you can find the right mix of 3rd party tools, Twitter can be a very productive and social tool. Find some of the top Twitterati at Guy Kawasaki’s Alltop page for Twitter. Nice screen shot of Twerpscan… I believe that’s Calcanis at the top of the list of people you shouldn’t follow back. When I was reading these, I thought “oh cool” and then caught myself thinking these were for Friendfeed instead of twitter. Twitter so limited, when put in scope of Friendfeed. Sure, these are cool, but such a small part of the big picture. Igor, quotably.com is down for maintenance tonight. Will check it again in the am. Faris, the Twerpscan shows good and questionable Twitter accounts inter-mixed – unless you sort them. Jason Calcanis comes up as very authoritative. TranceMist, I don’t mention Friendfeed until much later in the post – not sure where that impression would come from. However, you’re right in that it would be great to see some 3rd party apps for Friendfeed. Thanks for these. I agree that quotably.com is worthwhile. I used it when Twitter was not working the other night (to post from). Lee, thanks for keeping on top of this stuff and helping point people in the right direction! GREAT list! There are some HUGE time savers here. Thanks. Great list, thanks for sharing! I’d maybe add Tweetburner to it (www.tweetburner.com), a nice tool that helps tracking what’s happening with the links you twitter. One more tool I’d include – Twitter Karma, which lets you see in one place who follows you and who you follow. Great for quickly discovering your network of complete (or incomplete!) connections. A great time saver. Lets your send files, pictures & video to your twitter followers either privately or publically. Excellent post. I love learning about new ways to use or view twitter friends. 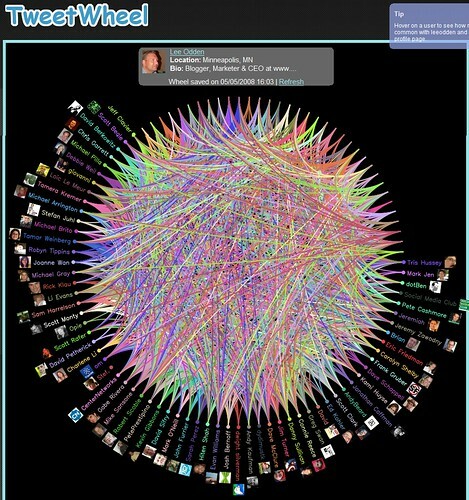 TweetWheel is pretty cool and Summarize is as well. I cover new Twitter stuff at @twtooltrack. Excellent summary of some of the latest new tools. Twitter is THE human feed: RTS (Real Twitter Syndication). nice post. TweetWheel is great! Really useful post. I`ve heard of a couple of the tools but not all of them. I don’t use Twitter. Maybe if I did I’d have another way to contact you…was wondering if you wanted to grab a bite to eat down at the BBQ joint sometime this week or next? I went by it yesterday @ 1pm and it wasn’t open…they’re still running right? Shoot me an email and let’s set something up. Thanks for a intresting list. Five really nice resources, Lee, succintly described. Thanks for the pointer. Nice list. I’d add to it the Siphs integration with Twitter. When I use Siphs to bookmark sites, the link automatically posted to my Twitter feed. I would have to say I really like twitterfeed (http://twitterfeed.com/), for feeding my blog to twitter. They support OpenID which is a plus, are reliable, and pretty easy to use. I’m relatively new to Twitter and these tools just made the experience MUCH more valuable and shaved months off my learning curve! great list, thanks. and thanks to http://twitter.com/waynesutton for the tweet. Good write up. I created a twitter account a long time ago and now it seems like the people worth following are starting to use it so now I am using it every day. Cool list…thanks! This might make twitter a little more interesting to use. Thanks for the list. I came across the tool TwitterLocal.net. It allows to filter out Tweets by location. We can generate an RSS feed to pull up Tweets from a certain area, specified by city, state, postal code, and a mile radius. Re: TwitterLocal.net tool. I have just tried to access the website and it is temporarily unavailable but check this out later on. This is a really cool and neat Twitter app. Great post, thanks. It’s good to have objective ways to decide who to follow. As I point out in my blog TwitterThoughts, choosing who to follow and block is crucial to a meaningful Twitter experience. However, it’s not just a numbers game. As one of your commenters points out, Jason Calcanis looms large in the Twitterverse, but most of what he puts out is self-promotional. As opposed to answering the question “What are you doing?” the most important step to a worthwhile Twittexperience is to ask “What do I want to know?” Start there and you won’t go far wrong. Wow, what a waste of time! Do any twits ever get any work done? Ahhh…so many fun things and so little time!! Very good and relevant topic! I really want to post this to my blog, what are your rules on that? Great article , but i think tweetwheel takes too long. I kind get board in the middle & close the window. I’ve been using Twitter for a while now, but never really did much with it, but after seeing some of these tools I’m inspired to build up a following again! Great tools…I’m new on twitter, and everyday I found it more interesting! It’s interesting to see so many peripheral or ancillary services cropping up around Twitter. Twitter has not settled on a business model yet so I think these third party developers are taking a huge risk. On the other hand, Twitter has created so much passion around its service that this outgrowth of third party apps are a testament to its useful and sticky nature.